"The LESI Guide to Licensing Best Practices, to which I was proud to contribute, has found solid acceptance in the international licensing community. The new volume of Licensing Best Practices maintains this high standard. It was designed to be complementary to its predecessor and broadens the scope of the scholarship. Standing alone, Licensing Best Practices is a valuable source of contemporary information. In combination with The LESI Guide to Licensing Best Practices, we have a very valuable source of insights and practical knowledge." "Few if any other intellectual property references lay the required geographic foundation for the scientific, business, and legal issues presented. Goldscheider and Gordon demonstrate that tech transfer occurs in a global arena. 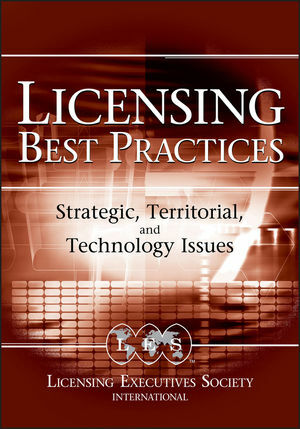 The book lives up to its title: Licensing Best Practices." ROBERT GOLDSCHEIDER conceived and edited the first volume and is Coeditor of this book. He is an attorney and pioneer of the profession of technology management consulting. He heads the International Licensing Network, which was formed in 1975. He has also established precedence as an expert in litigation and has testified over fifty times. Mr. Goldscheider is the author of two treatises on licensing issues that are regularly update and has published over thirty articles on licensing-related subjects. He has been active in LES since 1967, has regularly lectured at LES and other meetings around the world, and believes he has taught more people about licensing than anyone alive. ALAN H. GORDON has thirty-five years' experience in the practice of intellectual property law. He established Alan H. Gordon & Associates after having been aprincipal/partner of Fish & Richardson, P.C. ; a partner/shareholder with Arnold, White & Durkee (now Howrey, LLP); and an associate with Burns, Doane, Swecker & Mathis (now Buchanan Ingersoll P.C.). He earned his BS in engineering from Columbia University in New York City and his JD (with Honors) from The George Washington University in Washington, D.C. He is a registered patent attorney in the U.S. and a registered patent agent in Canada and the Philippines. He is an author and frequent lecturer in the intellectual property area and has appeared numerous times as an expert witness in patent, trademark, trade secret, and licensing cases. Mr. Gordon has served as a local chapter chair, committee chair, trustee, vice-president, and secretary of the Licensing Executives Society (USA & Canada). by John G. Palfrey, Jr.